Stickers, ineffable wonder, and childhood go hand in hand. And perhaps Mario has always spoken to this. Cliff Bleszinski once said that "There's something about the hidden element to Mario where you jump and hit your head on a block and just out of nowhere secret things would appear. They made you feel like a kid in the woods finding god knows what." 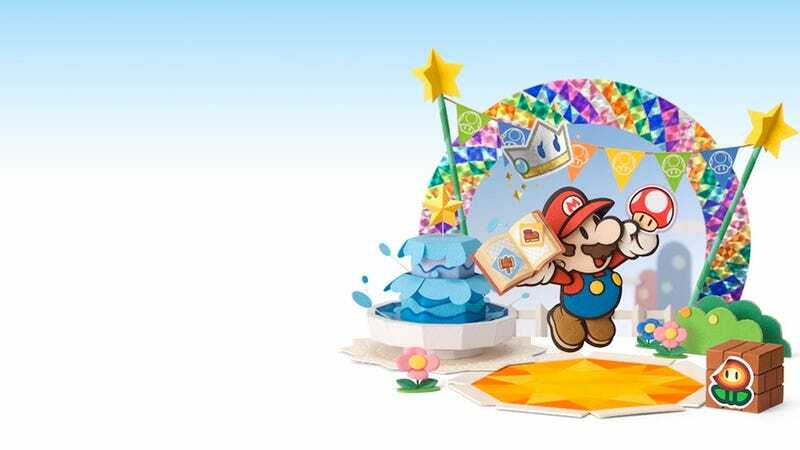 Still, few Mario games capture the magic spirit of being a kid as well as what I played of Paper Mario: Sticker Star last week. That the game features stickers in enough varieties that would give a kindergartener an aneurysm is only one the start of it. The premise is this: there's a sticker fest, which is held to observe a sticker comet in the sky. It's a sticker that is rumored to make wishes come true. What else would a special comet sticker do, really? But then—as you probably guessed—Bowser happens. Bowser ends up accidentally breaking the sticker into pieces which spread across the Mushroom Kingdom. You have to retrieve them, of course. Then Bowser steals Princess Peach. Again. Mario games are not ones for giving us particularly complicated reasons for setting off on an adventure—not that they have to. But what amuses me here is that we're all fighting over a freaking sticker. A magical sticker, sure, but still! This isn't a criticism—it's guilelessly, innocently perfect. I mean, after you defeat a miniboss, he whines and calls you a cheater. Probably not unlike a playground bully. Then in a fit of rage he rips out a bridge you need to cross and puts it on top of a hill. Really mature, koopa! Fitting that this is a world where clouds are held up by strings, crepuscular rays are distinct pieces of golden paper alternating in gilded hues, and coin edges show off corrugated cardboard. The charm is found in the small details of a world that feels less like a detached creation of code and instead like a paper diorama imagined by a child—perhaps one that would be younger than the kid who would dream of the sophisticated terrain found in Media Molecule's Tearaway. You can view this all in crisp 3D, and the paper outlines make the visuals pop. Literally: at times, the game almost seems like a pop-up book. It's delightful. Bowser ends up making a mess out of Decalburg, the starting town and seemingly the hub for the game, after the comet sticker explodes. You then have to go and find all the Toads in Decalburg who are either hiding from Bowser, or stuck. Like, have to peel them off walls as if they were stickers type stuck. The tricky Toads go in all sorts of places, making the search more involved than one would initially guess. This sets the stage for the rest of the game, where you find yourself searching every nook and cranny for stickers. Like Cliff suggests, Mario has always been a franchise about discovering who knows what in the proverbial forest. But the sticker search seems particularly fitting here. It's not just that the stickers provide you with power in combat, but the faith that there's more to your surroundings than what meets the eye is wonderful. As a kid, the jungle gym was more than just a jungle gym, silly. It was my secret base, and the Power Rangers convened there. And in Sticker Star, similar logic applies. That's not a bush, that's the hiding place of a sticker! Just need to hammer the foliage down to find it. The charm is found in the small details of a world that feels less like a detached creation of code and instead like a paper diorama imagined by a child. Under normal circumstances, there are three predominant uses for stickers in childhood. There are stickers to denote achievement—you got a gold star! We used stickers to highlight favorite places or things, like our rooms or guitars. And finally, we'd collect them with a neuroticism that refused to use too many stickers. They're special. Sticker Star proves that these are indelible ways of thinking about stickers. Where we use stickers to demarcate special things in real life, the special things are the stickers themselves in Sticker Star (or at least paper, obviously). Trinkets or objects you find in the world can be used in "puzzles" where you have to place the sticker in the appropriate place. The bridge that I mentioned earlier, for example, is rescued by Mario by having us place it back where it belongs by smoothing and stretching it out over the void. Lacking the traditional partners (unfortunately) that previous Paper Marios had means that we have to rely entirely on the stickers for our prowess. In combat you can see Mario perusing the pages of a scrapbook to decide his next move. These pages contain the stickers you've found on your adventure, and every move, regardless of how ordinary, has a sticker for it—jump, hammers, mushrooms, and so on. Every action has varying degrees of power, which a sticker exemplifies through a variety of sizes, shininess and flashiness. The bigger a sticker is, and the fancier its surface is, the better. The game doesn't even have to tell you that. You just know. That's how stickers would work. So if we got stickers for being adroit academics or being remarkable in real life, Sticker Star gives us the opportunity to show that we're good for it. Do you simply take turns attacking and taking damage, or do you go the extra mile by pressing down right before an attack hits for extra damage or defense? Doing the latter makes the battles feel slightly more urgent than your average turn-based skirmish, though this setup is typical of Mario RPGs. New to the Mario RPG combat lexicon is the battle spinner, which is a slot machine mini game that occurs before a battle. You have to spend a bit of money to use it, and the more money you spend, the higher chance for a jackpot you have. Every matched icon not only grants you an extra turn in battle, but can have a special effect as well. I'd tell you what these are, but apparently I'm terrible at slot machines! Personally I didn't find that I had to use the battle spinner often, as normal attacks were capable of hitting multiple enemies at once for high enough damage to defeat them in a turn or two. Then again, you are largely battling enemies like koopas and goombas at the start—not exactly the most fearsome of foes. It's possible that the battle spinner becomes more useful as you go along, since toward the end of my demo enemies started to pack a punch. Beyond this, picking what stickers to use in combat speaks to how we like to think of stickers. You don't want to use the shiny big ones just willy nilly! Heck, you may feel disinclined to use anything outside of the boring varieties period. I found myself hoarding all the variation stickers until I had no choice but to use them. Fortunately, as you progress you unlock more pages in your book, which allows you to keep more stickers in your inventory. To give you an idea of the type of variation we're talking about here: there's regular hammer, worn hammer, eekhammer, hurlhammer, slaphammer, baahammer. On top of having shiny variations of differing sizes, these all had different effects (the baahammer, for instance, put enemies to sleep) and required unique timing for the extra damage. It's not just that the stickers provide you with power in combat, but the faith that there's more to your surroundings than what meets the eye is wonderful. As you play along, you find more and more stickers—and there's a genuine excitement that comes with finding a new one. You expect to learn new moves as you play RPGs, and maybe they're cool, satisfying moves to boot. But rarely is the mere idea of getting a new move and fantasizing over what the move does as potent as it felt with Sticker Star. And I think the moves being stickers, which are innately thrilling on their own, has everything to do with it. At first glance, having the game revolve around stickers doesn't seem like it would make much of a difference. But it totally does. Jason remarked that 10 minutes with Sticker Star didn't seem like it was enough—neither did a couple of hours with it. There's no other way to put it: Sticker Star is a charming joy to play.